There are many reasons for property mangers and building owners to consider using regulated meters over non-regulated — the primary one being the requirement for an approved instrument of measure when allocating energy costs to building tenants. And even if current objectives are not for the purpose of billing, objectives change. With the small total incremental project costs associated with using approved meters versus unapproved — it makes sense to keep your options open. It‘s important to note that there are many products out there that act as power measurement and monitoring devices that cannot comply with the requirements of an approved meter. Triacta’s design philosophy, however, is to ensure that our products meet the most stringent approval requirements. 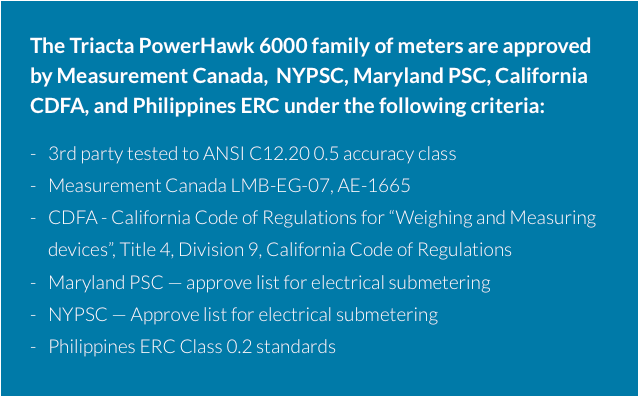 The Triacta PowerHawk 6000 family of meters are CDFA certified, NYPSC listed, Measurement Canada and Maryland PSC approved, and independently verified to ANSI C12.20 Class 0.5 and Philippines ERC Class 0.2. 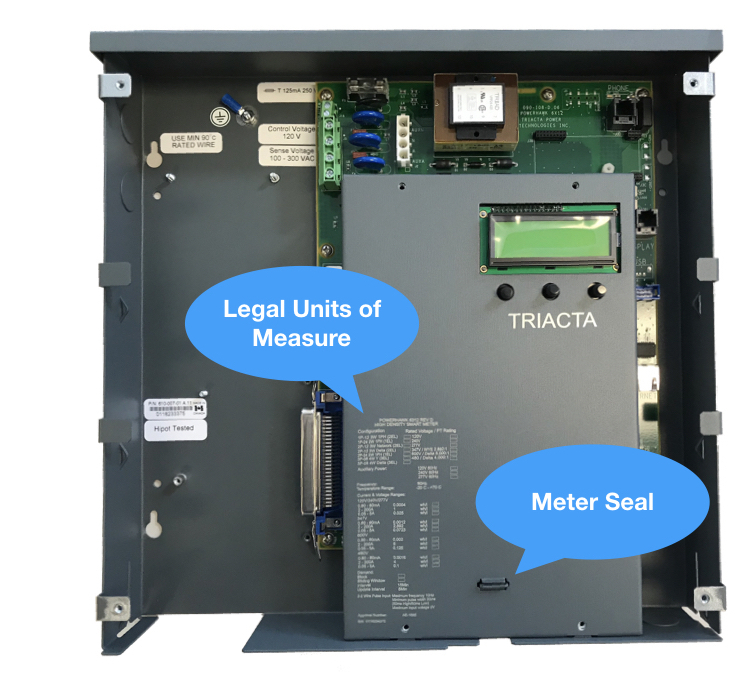 Our newest metering platform — the Triacta GATEWAY — was designed with the same stringent metrology as the PowerHawk family, with the intent to be approved under these and other standards worldwide — including Europe’s MID standard, which sets the tone for most countries outside of North America. At Triacta we have been designing and developing multi-point electrical meters for highly regulated markets since 2003 — so we know what it takes to make meters that meet and exceed the highest industry standards. Let‘s take a deeper look at what it means to have a meter that is “regulation approved” — both from a standards perspective and how we implement those standards at Triacta. The gold standard for meter accuracy, and what is typically required in billing applications, is ANSI C12.20 0.5 accuracy class. 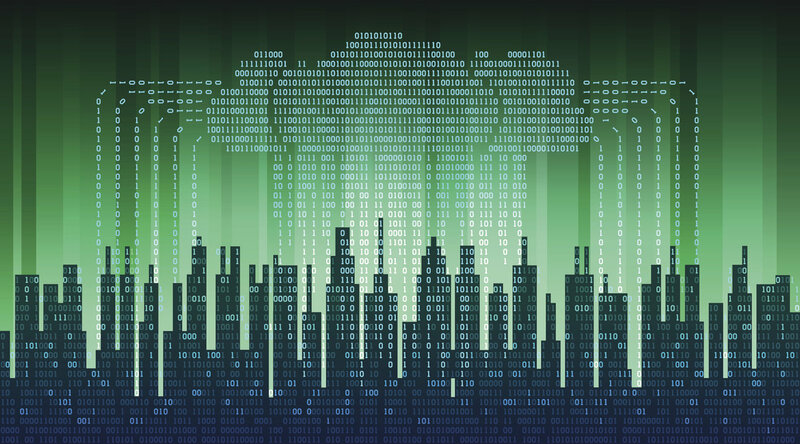 It has been common in the past to allow companies to self-declare their adherence to this standard, but most jurisdictions prefer a third-party test — so third-party compliance testing is becoming the norm. 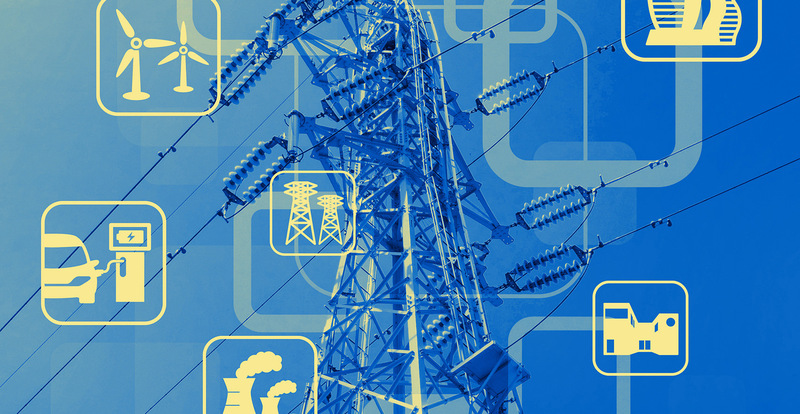 This ANSI standard sets out a number of criteria for the electrical performance of a meter over specific environmental and electrical operating ranges — with optimal conditions demanding performance within a +/- 0.5% error. It’s not good enough to just test a meter at room temperature for accuracy and declare victory. Meters must pass testing across all ranges of typical meter deployment in order to meet the standard. It's important to note that the combined errors of an electrical meter PLUS the current transformer together are what constitutes an acceptable accuracy performance of a metering system. Meter accuracy is applied differently depending on the type of meter in question. When it's a type approved integrated single-point meter, such as a residential or light commercial meter mounted in a meter base, 0.5% refers to the total accuracy of the meter plus current sensors that make up the metering system. When it's a type approved transformer rated meter, with type approved external current transformers, the accuracy of the meter (0.5%) plus the accuracy of the current sensors (0.15% to 0.3%) results in a metering system accuracy specification of 0.65% to 0.8%. Despite this anomaly in the way different types of meters are approved, the combination Triacta’s transformer rated meter plus Triacta’s current transformers have been 3rd party tested as better than 0.5%, and therefore have no problem meeting ANSI C12.20 class 0.5 accuracy class. The advantage of using "type approved" components guarantees that any “type approved” meter plus any "type approved” current transformer will meet the system accuracy performance requirements. Triacta type approves all of its meters and current transformers to ensure the maximum flexibility in application. Triacta PowerHawk meters have been third-party tested and verified by MET Laboratories to fully meet the requirements of ANSI C12.20 class 0.5 accuracy class. Triacta’s PowerHawk meters have also been comprehensively tested by Measurement Canada for over 14 years and have achieved their coveted ten year initial seal period. The Triacta GATEWAY metrology is based on the PowerHawk meters and initial testing has demonstrated that it is equal to the PowerHawk line of meters. A problem facing meters is that they are known to drift and become less accurate over time. In fact, they may drift completely outside of the specification for which they were originally approved and become non-compliant. To address this issue regulatory bodies create re-verification requirements which consist of setting a valid “seal period” — with a compliance test methodology for a meter population to validate their accuracy over time. This process results in either a pass and “go-ahead” for continued use under a new set of constraints (for example new verification period) or the requirement for the replacement of the meters altogether. It’s extremely important, therefore, that meters remain accurate for as long as possible and that they have a cost-efficient installation and replacement methodology which facilitates easy removal, testing, and replacement. Measurement Canada approved meters start out with a 6-year initial seal period and can be sampled after 4 years in the field to statistically determine whether the meter can be approved for a 4-year initial seal period extension, or a 10-year initial seal period. No failures are allowed in the sample. Not only have PowerHawk Meters passed such a test and attained a 10-year initial seal period from Measurement Canada, but the sample base showed NO perceptible drift from the accuracy at the time of manufacture 4 years earlier. In today’s metering world the days of just needing to know monthly kWh consumption are over. Time-of-use, peak demand, VA demand, energy received and energy delivered are all becoming important considerations. How these measurements are taken and delivered have very rigid specifications, and a meter must be approved by the regulatory entity with regards to each of these parameters. Triacta’s metrology design — deployed in both the PowerHawk meter family and the Triacta GATEWAY system — reports on the following Legal Units of Measure (LUMs) as defined by Measurement Canada: Watt Hours (Wh) (delivered by the utility and received by the utility), Volt-Amp Reactive hours (VARh) (delivered by the utility and received by the utility), Volt-Amp hours (VAh), Peak Demand KW (delivered by the utility), Peak Demand KVA (delivered by the utility), Watt demand, Volt-Amp demand. Meters are sealed in some jurisdictions to ensure that an intruder cannot tamper with the instrument without it being evident. It’s impossible to make something completely invulnerable to tampering, so regulators make “tamper evident” the goal. Meter sealing also ensures that all in-service meters are verified to be accurate. Sealing a meter usually demands 100% testing for all parameters (kWh, Peak demand, VA demand, energy received, etc.). Meters usually have 2 levels of sealing — the meter seal and the utility seal. The meter seal is typically applied by an accredited entity that performs 100% verification testing. There must be a cover over the part of the meter that could be tampered with (electronics), which is then closed shut with a tamper evident seal. The utility seal is applied by a service provider in the field — applied to an external housing that covers the connectors between the meter and the circuit being measured. 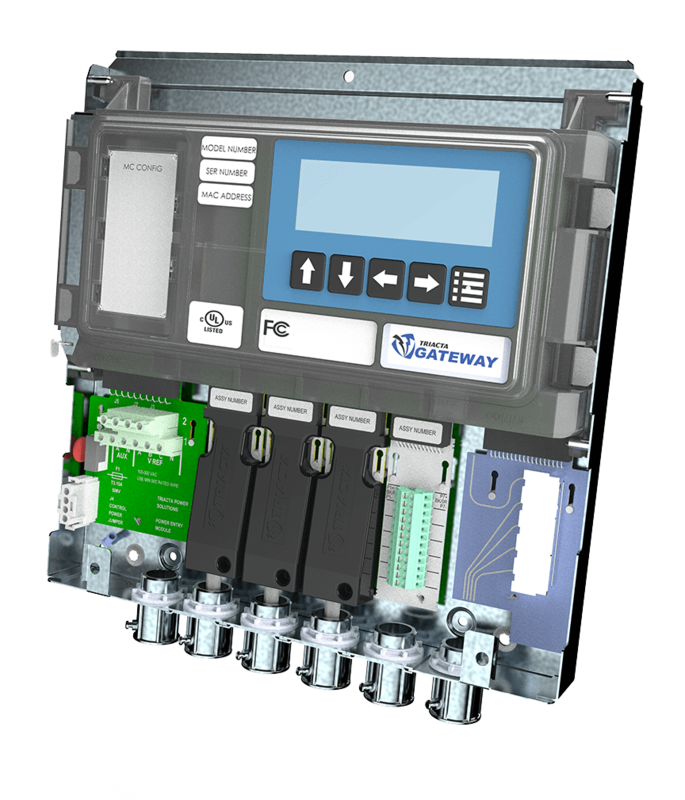 A significant portion of a modern meter is digital in nature and therefore dependent on firmware control. When a meter is approved in a jurisdiction there must be a very clear demarcation between code that affects the metrology (the measuring function of the meter) and any other functionality (communications for example). Any firmware revisions must be catalogued and communicated to the regulatory body, which must then approve them before they are implemented. Because a meter’s functionality is tested before it is sealed, no changes can be made to its metrology firmware once a seal has been applied. A vendor must implement mechanisms that will ensure that no such changes can take place “under seal”. For example, a switch that disables updates in the metrology code may be employed. 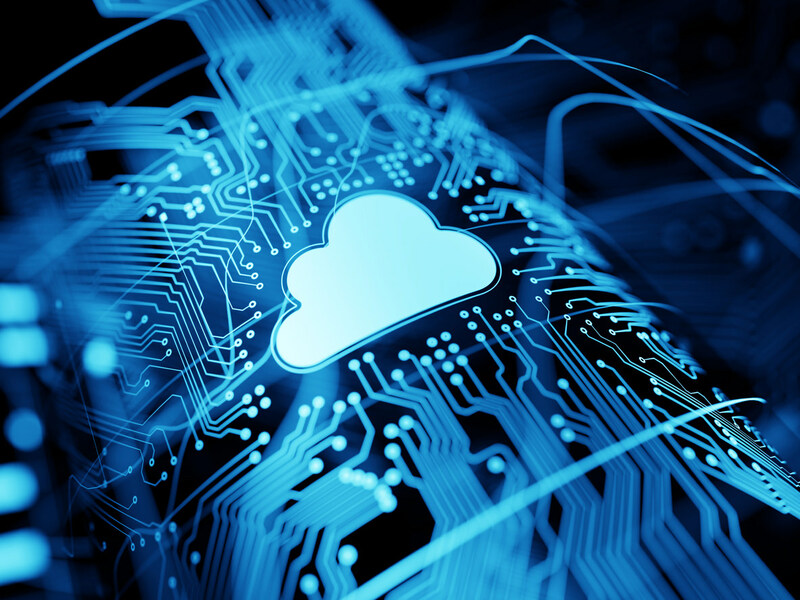 If other parts of the firmware are intended to be updated, the methods for such an update must be clearly communicated and agreed to by the regulatory body. For example, a meter may have a 2-processor architecture with a dedicated metrology processor to physically separate sealable functionality. At Triacta our goal is to make our meters tamper evident while also making them easy to work with when needing to be sealed, installed, and verified. 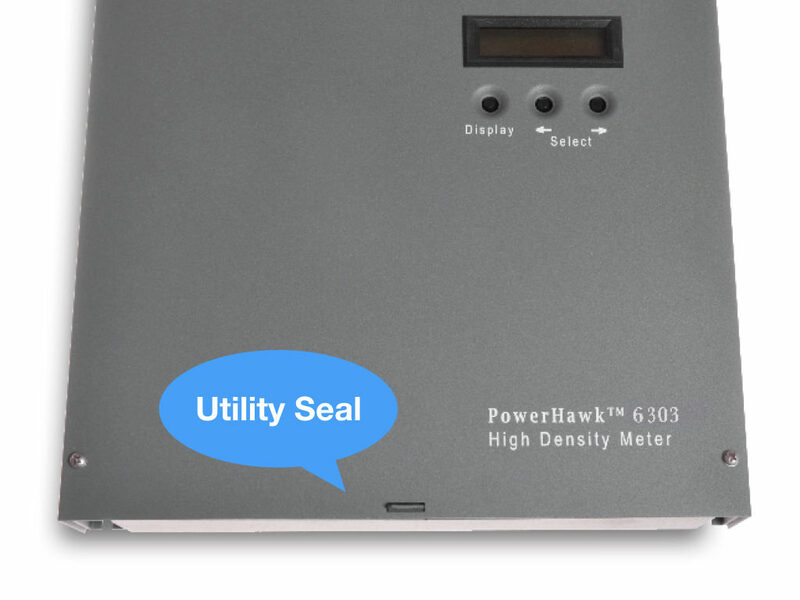 For the PowerHawk family of meters our approach is to locate the metrology firmware module within a sealable metrology enclosure — where it cannot be tampered with unless the metering seal is broken. Additionally, the metrology components of the meter live under a sealable utility cover — where any kind of tampering is easily evident. 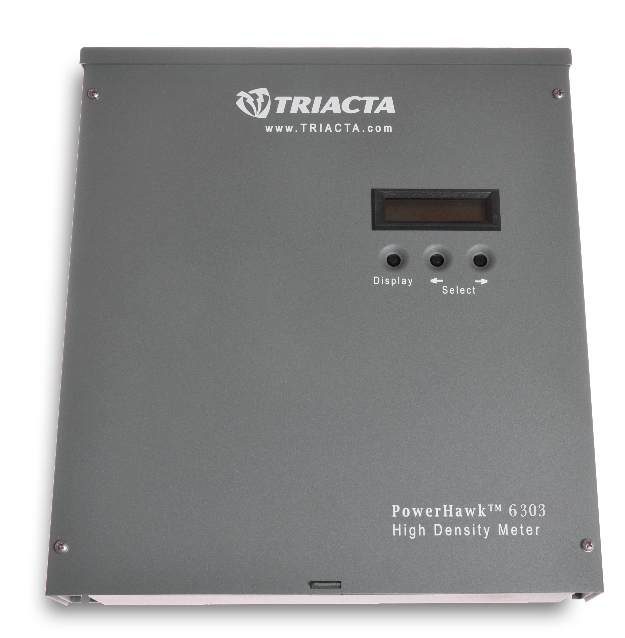 The Triacta GATEWAY has improved the sealing approach of the Triacta PowerHawk family by making it easy to separate the meter base which houses the cabling and electrical termination of the meter from the meter itself — which can be sealed at a meter shop and installed in the meter base at a later date. This approach also enhances the process of verification, allowing a meter to be easily removed and replaced by the same meter or a substitute, without interfering with the electrical services being metered. 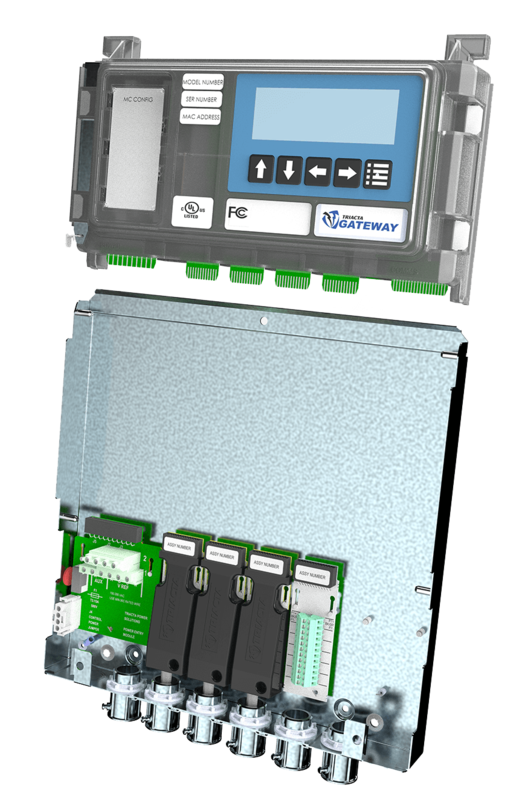 The Triacta PowerHawk family implements programmatic protection by providing a programming switch which are under the meter seal of the product. This allows the latest revision of software to be downloaded into the meter prior to application of the meter seal. 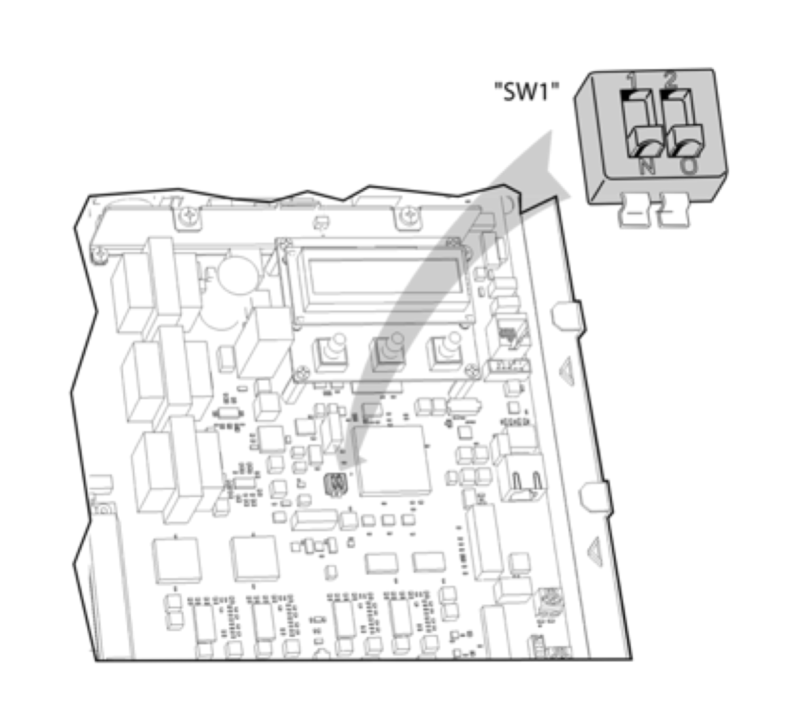 Once the firmware is downloaded, the programming switches is placed into the off position. After the programming switch is in the off position, the meter cover is put into place and the meter seal is applied. The meter can no longer accept any firmware updates. Each firmware revision representing any type of change in the metrology code must be individually registered and approved by the regulatory body. The firmware revision is displayed on the LED display of the meter when selected by the meter’s navigation switches. Even if a regulatory body does not have a verification regime which can test the operation of the new update, Triacta still registers any changes and only releases a change when it has been attested by a jurisdiction that can perform verification. The Triacta GATEWAY takes a slightly different approach to the programming switch. Rather than have a switch under the meter cover itself, the switch is under the sealing mechanism. The Triacta GATEWAY also provides separation between the actual metrology code and the rest of the software by providing a completely separate metrology processor. When the programming switch is in the locked position, the metrology processor firmware cannot be changed but functions of the meter not regulated by an approvals body (communications, applications. etc.) can be updated. A regulated meter must have labeling that clearly marks the certification it is working under and the legal units of measure that it is sealed for. Like the meter seal, this labeling must also be tamper evident. The Triacta PowerHawk shows the Legal Units of Measure for which the meter complies laser inscribed on its metal casing. This provides an indelible record of the meter configuration. 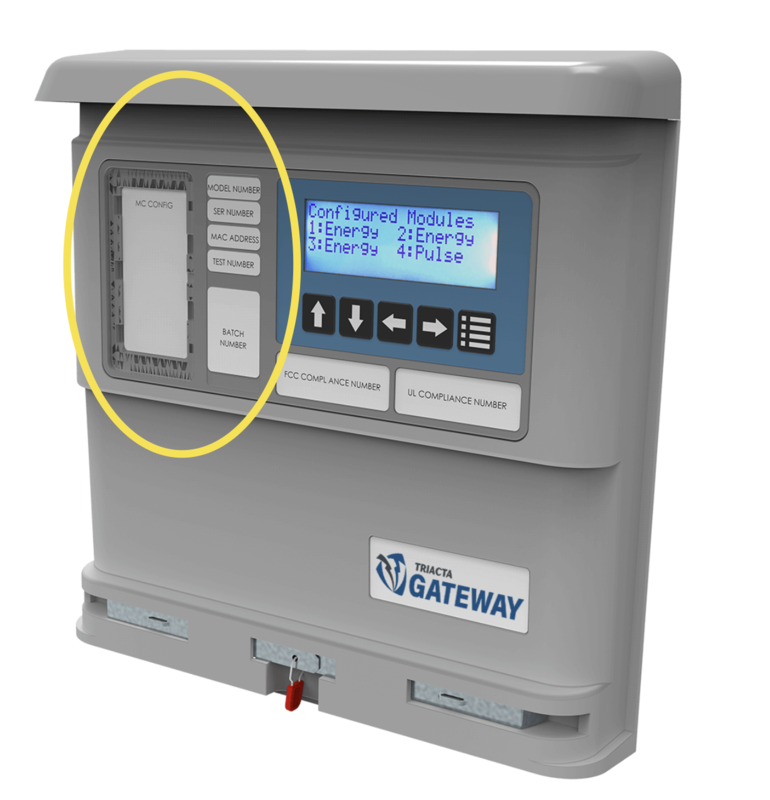 The Triacta GATEWAY takes a somewhat different approach, which is to place a small card with the appropriate information under a plastic cover which can only be removed when the meter cover is removed, and this is possible only when the meter’s seal is removed. Although most reporting is done electronically via file transfer, a meter used as an instrument of weights and measures has to deal with legacy concepts of accessibility. This typically means access to a physical display. Jurisdictions generally have requirements and specifications related to a meters display size and legibility. 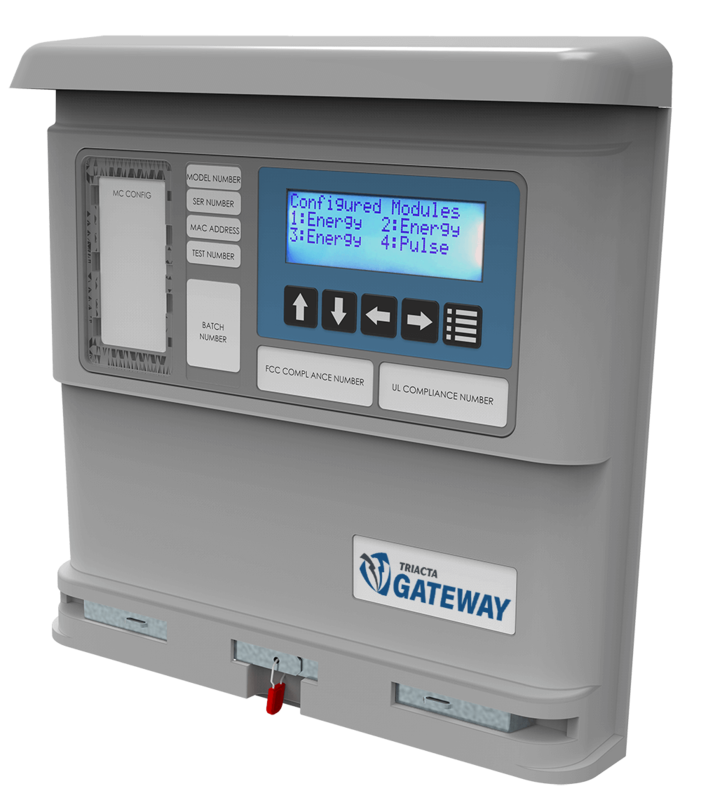 The display of the Triacta PowerHawk 6000 series meets the requirements laid out by the American National Standard for Electric Meters (ANSI C12.1). This standard establishes acceptable performance criteria for new types of AC watt-hour meters, demand meters, demand registers, pulse devices and auxiliary devices. It describes acceptable in-service performance levels for meters and devices used in revenue metering. The display of the Triacta GATWAY exceeds these requirements. For electrical submeters (which are typically within a building) it is very common that they must conform to the National Electrical Manufacturers Association’s (NEMA) published specification for enclosures for electrical equipment (NEMA 250-2014). Triacta performs 3rd party lab testing for NEMA 250-2014 compliance on all of its products. 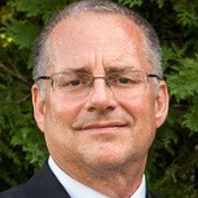 If you are going to bill tenants or participate in government incentive programs, you need to choose a metering platform that is robust and accurate enough to handle the job. Installing cost competitive meters that are regulation approved means you'll have a system that is legally up for the job — and one that will provide you with a reliable building information platform for years to come.